His death was not unexpected though. He had in fact complained of having been unwell for sometime in the letter dedicated to his former pupil Alberto Pio in his last book, the Lucretius of January 1515. The loss of such remarkable a printer and editor was nevertheless mourned by Venetian scholars, humanists and “bibliophiles”. On Thursday 8 February it was mentioned in his diary by Marin Sanudo, the Venetian politician and chronicler: “Two days ago don Aldus Manutius the Roman died here in Venice; he was an excellent humanist and Greek scholar and was the son-in-law of the printer Andrea [Torresani] of Asolo. He produced very accurate editions of many Latin and Greek works with prefatory letters addressed to many, dedicating a number of little works to me, Marin Sanudo. He also wrote an excellent grammar … This morning, the body having been placed in the church of San Patrinian with books surrounding it, the funeral rites were held. An oration praising him was recited by Raphael Regio, public lecturer in humanita in this city”. The 500th anniversary of his death is celebrated this year by libraries and institutions all over the world. 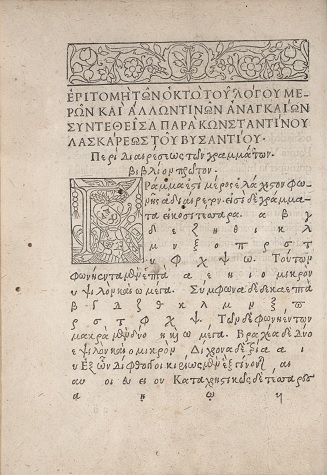 Cambridge University Library joins in with a small exhibition of books published by Manutius between 1495 and 1515 (plus a couple of others) on display in the library Entrance Hall, from Monday 6 February to Saturday 7 March 2015, with an enlarged online version at https://exhibitions.lib.cam.ac.uk/manutius. Drawn from the library holdings of incunabula and early sixteenth-century Aldine editions, the exhibition celebrates Aldus’s achievements as the most successful editor, printer and businessman in Renaissance Italy. The individual history of some of these books also illustrates his importance as a highly respected humanist, scholar, linguistic and grammarian who could converse at equal level with humanists of the stature of Pietro Bembo and Erasmus of Rotterdam. 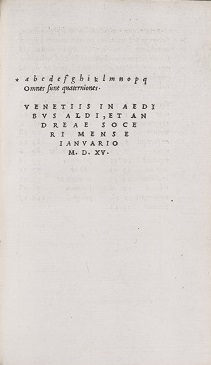 Marin Sanudo, Diarii, 8 February 1515, as translated by Linda L. Carroll in Venice. Cita excellentissima. Selections from the Renaissance Diaries of Marin Sanudo, eds P. L. Labalme and L. Sanguineti White. Baltimore: Johns Hopkins UP, 2008, pp. 432-433.